yes, it’s the first day of spring, so get ready for lots of sunny music and recipes, and crepes! Yes that great showcase for the food of our region, and simply great day out under the trees of the Bangalow Showgrounds, is on again this weekend – if you are anywhere near the Northern Rivers on Saturday 13 September, make sure you head to Sample with many hungry friends. All the information you need is here, including a downloadable programme. But the most important event at Sample this year is the launch of Anthea’s cookbook, a collection of favourites called : Passion – organic vegan recipes to live for. And if you think all that sounds too healthy to be fun, you haven’t tried her food, so check out the sample recipes below, or taste what she is making on stage on Saturday – the Northern Rivers Food Cooking Stage, 2 pm. broad beans contrasting with the black of the wild rice. Visually this salad is gorgeous. Brown rice is underestimated as a wonderful health food. Brown and white rice have similar number of calories, carbohydrates and protein. The differences lie in processing and nutritional content. When only the outermost layer of a grain of rice (the husk) is removed, brown rice is produced. For white rice, the next layers underneath the husk (the bran layer and the germ) are removed also, leaving mostly the starchy endosperm. Several vitamins and dietary minerals are lost in this removal and the subsequent polishing process. One cup (195g) of cooked long-grain brown rice contains 84mg of magnesium while one cup of white rice contains 19mg. Steam the snowpeas for 1–2 minutes or until bright green and crunchy. Cool in water, drain, then slice on an angle into thin strips. Combine ingredients for the dressing in a jar and mix thoroughly. Toss all ingredients in a bowl with the dressing and serve. For a vegan or vegetarian, eating out can be an uninspiring event with little choice on a menu. 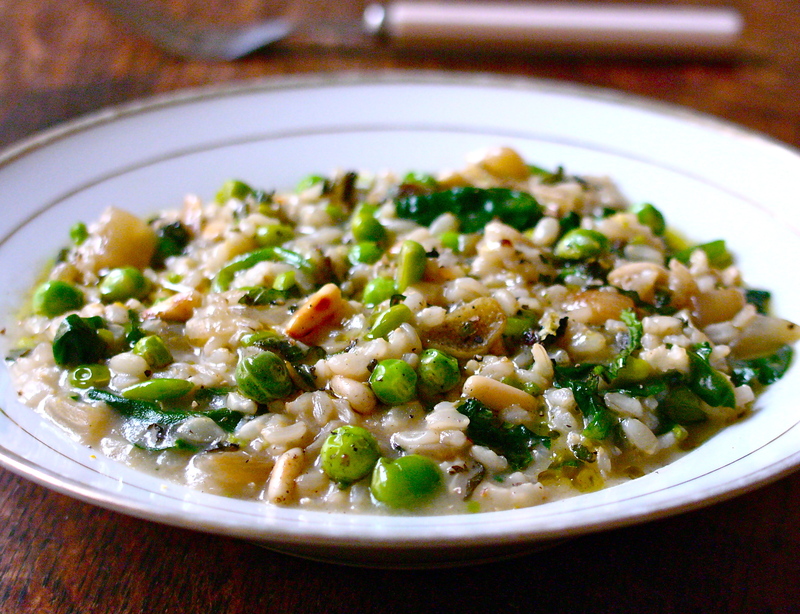 Risotto is often one of those choices. A vegetarian or vegan risotto done well is lovely, creamy and full of flavour, but that’s not always the case! Creating flavour is actually easy. Vegetable stocks and fresh herbs can make up the basis of the flavour. I always use olive oil to add richness to a risotto. Garlic, onion or leek, slowly caramelised, also add to the flavour and body of a good risotto. Spices like nutmeg go beautifully with pumpkin or broccoli. Fresh thyme or sage or any of the Italian herbs pair well with red wine and mushroom. Artichoke heart and roasted fennel partner well with most Italian herbs and/or lemon zest. Using citrus zest, green or black olives, chilli, sun-dried tomatoes or capers can take a simple risotto to a whole other level. I also use brown rice instead of traditional arborio purely for nutritional reasons. It may take a bit longer to cook than arborio but the health benefits far outweigh the extra time and the end result is nutritious, creamy and delicious! 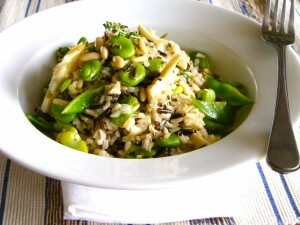 Note If you have leftover brown rice, then you can make this meal in 20 minutes. absorb the liquid. Keep doing this until the rice is creamy and soft. seasoning and re-season if need be. warm stock water when the recipe requires, see above. Lightly stir-fry the peas in a frying pan with a splash of water to slightly steam them. mint, freshly zested lemon or lime, and pine nuts. Delicious! Never again will I be able to make crepes without the image of Cecile’s mother’s bum going round and round as she beat the crepe batter for the kids every weekend – and I’ve never even met her! Leave it to rest for at least an hour, in the fridge. as long as it’s not scratched. and on sides in order to get a flat thin crepe. enough to be flipped over. on a plate and cover with a kitchen towel. Repeat process for all batter. Melt sugar in a pan on a very low stove. DON’T BURN IT !!! Take it out of stove if it gets too unmanageable. CAREFUL WITH splashes of very hot caramel. Finally slowly add cream to caramel, being very CAREFUL with splashes again. up to 3 days in the fridge. Spread caramel on crepe and roll it or fold it in triangle. Garlic news – we import 3500 tons of garlic each year, Australia just can’t produce enough at the moment. A study by Steve Wylie at Murdoch Uni has found that this garlic carries many viruses that can be easily spread if you plant the cloves in your veggie patch. Wylie and colleagues went to supermarkets and collected 11 bulbs of garlic from Australia, China, the USA, Mexico, Argentina, & Spain. They found 41 plant viruses by extracting the genetic sequences in the bulbs.In addition, he says, native orchids can be infected by some of the viruses that infect garlic. As garlic is propagated by planting the individual cloves, viruses carried can be spread to other plants by insects when propagated by home gardener or thrown out in wild. And presumably from home composting too. Wylie says the study has broader implications because exotic viruses could be brought in with imported potatoes and sweet potatoes and anything else that propagates vegetatively, that is by planting the root or bulb or rhyzome. So the quick solution is, make sure you buy local garlic only if you want to plant it in your own garden, and toss imported garlic scraps in the bin. The bees are helping to suppress the presence of aphids, whiteflies and thrips among other insects. So far the mothod has been used on strawberryies, raspberries and sunflowers, the scientists are moving on to coffee plantations. Some trials of this technique were done in 2002 in Australia. The Australian bee industry this year is focused on dealing with drought and delayed crop flowering which have seen Australian honey production fall to its lowest level in 20 years. There are a few upcoming events you may be interested in attending. The fabulous Living Communities Festival is on again this Sunday September 7 at the Mullumbimby Community Garden, starting with a street parade at 10 am and goes until 6pm. There are talks, food, music, all sorts of entertainment and information, but it is worth checking out just to see what the people of Mullumbimby have acheived in a few short years on this site. Ten dollars for adults, free for kids, lots more info on the community garden website. Also this Sunday, chef Francisco is back from holidays with a seasonal pop up dinner at the Federal Hall, find Francisco’s Table on facebook for more info. Finally, Sydney chefs are into extreme burger wars. The burger craze has even swept up our fine dining chefs, inspiring them to open burger joints, and has seen an explosion in less common combinations, from the roo burger to pulled meat and bolognese versions. But the Sydney Morning herald has unofficially declared the extreme burger winner to be chef Danny Russo’s creation for Bertoni Casalinga in Balmain is extreme. Two pieces of lasagne, battered and fried, make up the “bun”, which encases a wagyu beef pattie, mozzarella and special Italian sauce. mm, just what you need to inspire a spring cleansing. Alice knows what keeping happy and healthy really requires.